Our product range includes a wide range of sorafenib medicine, sorafenat 200mg and soranib 200mg. Sorafenib 200mg is used for the treatment of primary kidney cancer (advanced renal cell carcinoma) and advanced primary liver cancer. sorafenib 200mg is a cancer (chemotherapeutic) medication. sorafenib 200mg interferes with the growth of cancer cells and slows their growth and spread in the body. sorafenib 200mg is used to treat a type of kidney cancer called advanced renal cell carcinoma. It is also used to treat liver cancer. Indication : Sorafenib is used for the treatment of primary kidney cancer (advanced renal cell carcinoma) and advanced primary liver cancer. 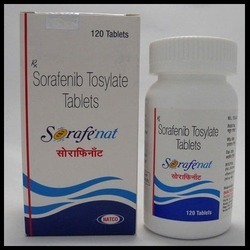 Sorafenat 200mg contains Sorafenib 200mg is used for the treatment of primary kidney cancer (advanced renal cell carcinoma) and advanced primary liver cancer. Soranib 200mg contains Sorafenib 200mg is used for the treatment of primary kidney cancer (advanced renal cell carcinoma) and advanced primary liver cancer. Soranib (sorafenib 200mg) is a cancer (chemotherapeutic) medication. Soranib (sorafenib 200mg) interferes with the growth of cancer cells and slows their growth and spread in the body. Indication : Soranib is used for the treatment of primary kidney cancer (advanced renal cell carcinoma) and advanced primary liver cancer. Looking for Sorafenib Tablets ?